It is spring, well technically at least even though we have been busy shoveling snow for the past two days. I got it light duster last year on my trip to London and if I am being honest it was a bit of an impulse purchase. However one year later, I have kinda-justified buying it. Above three looks - travel (1), brunch (2) and date night (3) are all styled around this duster. It is a great third piece to add to the outfit to elevate it from basic to 'stylish'. What do you think? Would you consider adding a duster to your closet? I, too, think it was a justified purchase, LOL! With all the ways you can style it, it's more than paid for itself. I think this was a great buy!! It looks absolutely amazing with all three outfits, very versatile and great for the warmer months when anything heavier is just too warm to wear. This would be a great little cardi while out in the summer evenings too! Lovveeee this duster, such a great style! Really really love the way that these were all styled. Think I am going to pic one of these up for the summer, will be a great piece to add to a capsule wardrobe. I'm not sure I'm cool enough to pull off a duster, but I definitely love those outfits! I've been looking at them to decide which one I like the best, but each is special in its own way. By the way, the bag on the brunch outfit pic looks great! I adore this duster Tanvi. It looks great in all three ways you wore it. It is perfect for the spring weather. Very cute duster. Cute combinations overall, my favorite is the with the shorts! I am so excited that dusters are in fashion! They combine well with just about anything. This is such a statement piece, but love all the ways you styled it! I love your style! Florals are so versatile for many seasons. The duster really look amazing and great for spring. I like how the duster will cover a little but not as hot. It also look very cool when you walk and when the winds blow on it. Look like doing the "fame walk" in the movie. Dusters are one of my favorites. Just one of those 3rd elements that adds a whole lot of chic. Love the shorts pairing. I've alwayws wanted one of these but never knew what it was called. I love them!! I have a duster similar but it is a black one and I absolutely adore the versatility! Ooo I love it styled all three ways! Such a great length too! It's amazing how all three outfits look so special with this duster, I think I need one this season! That duster is very chic, love how you styled it for each look. I am 10000% in support of dusters! Even my daughter has one! So darn cute and chic. I am in love with your date look. I would sport that any day of the week. Love all the looks! You look so pretty in all the looks. The duster looks like a great buy and works with so many outfits. I am loving all the styles. Love how you style the duster, I also like the color. It's perfect for Spring and Summer because it's light enough to use as a cover up! The printed duster is such a great way to transition into spring. They also add so much pizazz to a casual look. I love your looks here! Love how you styled this duster. Such a versatile piece! Oh I need a floral duster in my life. SO pretty. 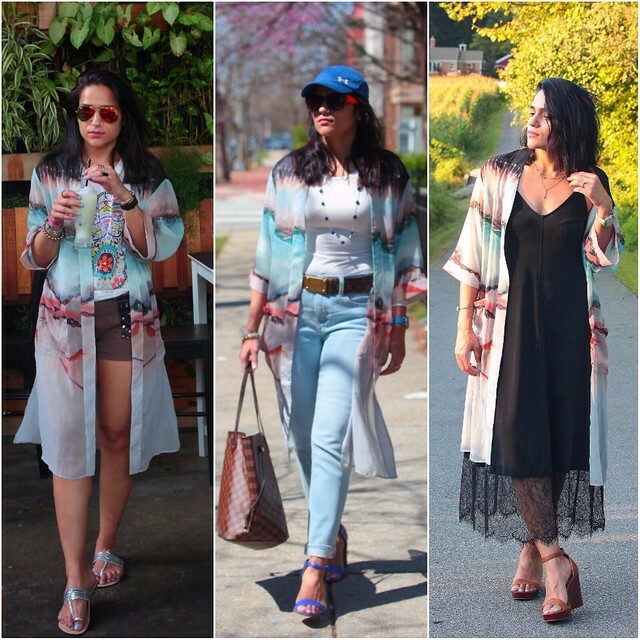 Love how you were able to style this duster 3 totally different ways!